***partially updated Dec 3rd, 2015***. I’ve decided to work on some variations of a BUCKET LIST, since I tend to think about these things a lot anymore. This LIST entry is things I’d love to experience again from my past. 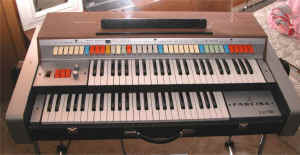 This is the lost love of my life, a FARFISA VIP 255 organ. More on that further on, but here is a video showing some of the sounds from this amazing keyboard. At the end of this post is a video from a song that used the Farfisa. Yes, I am musical. If my love of music hasn’t shown itself to you yet on Twitter and Facebook, then you are not paying attention. I come from a musical family. All of us showed some promise, led by the absolutely gorgeous soprano voice of my mother, Juliana. My mother, Juliana Hickman, singing MEMORY from “Cats”. This was shortly after she started getting ill.
Yeah, that is one hell of a 70’s tie, isn’t it. Damn thing was knit! The first instrument that I actually took up was the trumpet, complete with blowing out my cheeks (a definite no-no) and a very active spit valve. I was adequate, and I played with my grade school and high school bands at OUR LADY OF LOURDES and ST. TOMMY MORE in Philly. In 1965, our band traveled to the NEW YORK WORLDS FAIR and we played in a pavilion that I remember as being very near to the IT’S A SMALL WORLD exhibit. However, my true love was the keyboard. When I was around 7, I remember getting a Magnus Chord Organ for Christmas. Somewhere, there is a picture of me smiling while playing it, composing strange songs built on the push button chords. It had a small keyboard and white push button chord keys. A definite low end toy, but still, an organ. I took piano lessons a couple of blocks from my house, and sometimes actually practiced. I developed a love of BELA BARTOK, DEBUSSY, and CHOPIN. At the same time, I was listening to both my parents music, hence a healthy love of music from the 40’s and country, as well as my older brothers records, hence my love of THE BEATLES and 60’s music. 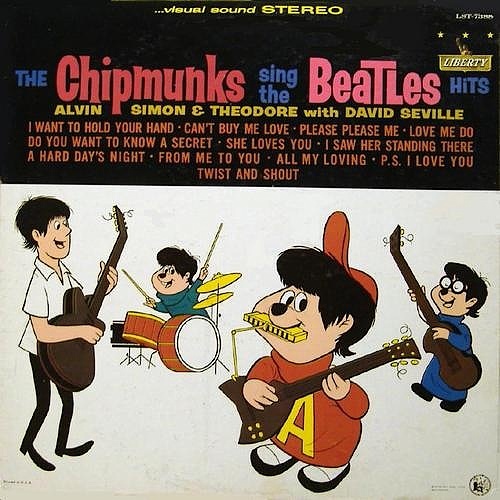 Because my brother already had them, I wound up buying variations of the LP’s that he had, like THE CHIPMUNKS SING THE BEATLES. 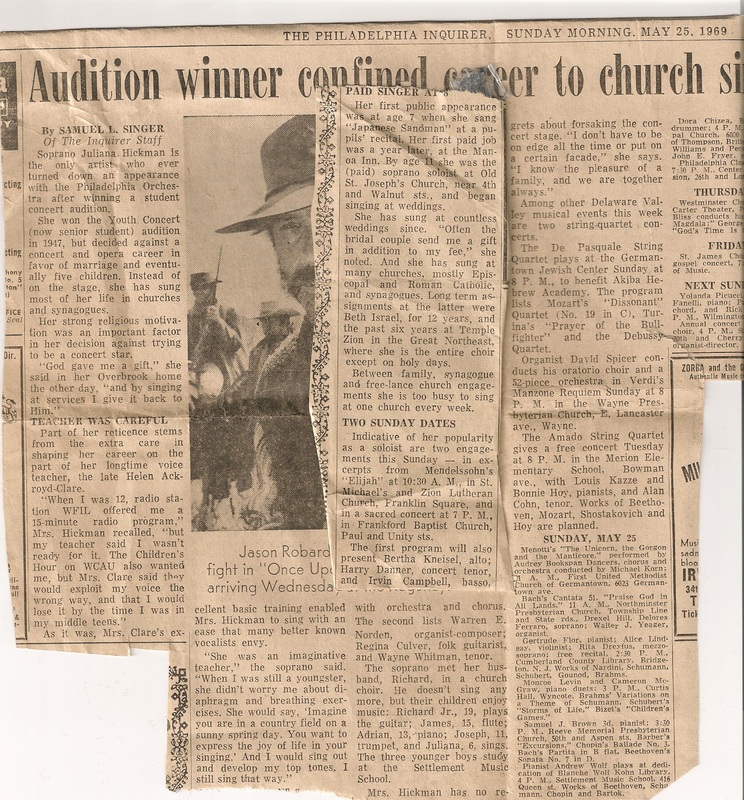 I also attended the SETTLEMENT MUSIC SCHOOL in Germantown (Philly). I took both lessons and music theory there for 4 years. This was back when SEPTA’S Route 65 was the E-Bus (and it always will be to me). Used to travel up two days a week, and then grab a fresh soft pretzel or maybe a quick sandwich at the Linton’s while the bus laid over at Germantown and Chelten. Flash forward to high school and 1969. Music had come a long way in the 60’s and by the time I decided that I wanted to play in a rock group, THE BEATLES were already near to calling it quits. High school allowed me to meet up with others who shared a common love of music, and we decided to form a rock group. Originally, we took a very 60’s name, MIND BODY AND SOUL (a Flaming Embers hit). Then we were briefly SIGN OF THE SUN, later shortened to SUN, which was the name of a nightclub in the old Valley Forge Hilton that we loved to hang out at and that didn’t always card. We later changed our name to THE JIM RASCAL BAND. 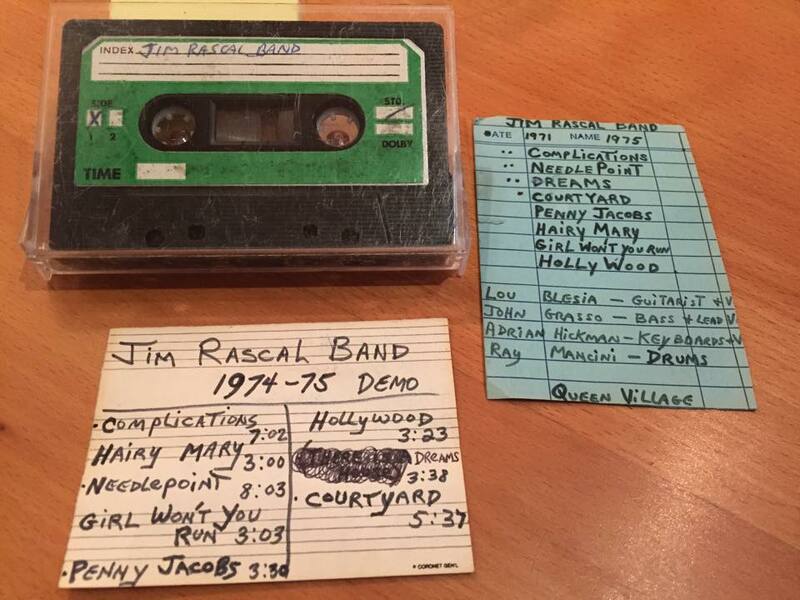 “Jim” came from our manager, JIM MAYER, who also called us “rascals”. We thought it was clever to have a non-existent front man the group was named after. At the same time, my love for the trumpet and growing love of jazz and brass, led by groups like BLOOD SWEAT AND TEARS, took my music in that direction. I was also influenced by the emerging prog rock scene. RASCAL started out as a wedding band, making $40 per person per gig. Our first event was a wedding at the Talleyville fire hall in Talleyville, Delaware. We played many such events and we were actually pretty good. We played what people expected at the events, right down to me playing TENDERLY way too many times. The band changed a little bit over time, but the main players were myself on keyboards, John Grasso on bass, Lou Blescia on guitar, Ray Mancini on drums, Carmine Ristaino played trumpet. Bob Eschelman played sax and Pompeo Riciutti played trombone. Our first drummer was Mike Giacomucci. As with most bands of the sixties and seventies, we were nomadic when we practiced. We played in so many basements that had we played in one more, we would have been reclassified as subterranean. The problem with playing in a basement in the neighborhood was that we could not really play loud and also we were all close enough to our homes to drift away during break times and come back way too late. The stroke of luck for us was that our bass player’s dad owned a deli in Ambler PA, just across from the Ambler Theater. Yes, this deli had a basement, but it had no neighbors, hence we could rock with abandon. Our practices went much better without the “at home” distractions. In fact, even refreshments were better, since we could shop right upstairs for something to snack on and drink. Our own little supply house. We practiced there for a majority of our existence, and were always good residents of the town, except when the weather was nice on Sundays and we set up our own Amblerpaloozas in the parking lot out back to practice. Crank it up, we said. Shut it off, Ambler police said. I also played a few other times where I wasn’t supposed to, like the time we had a retreat at a Vincentian seminary and yes, I decided that the chapel organ would sound great if I played IN A GADDA DA VIDA. 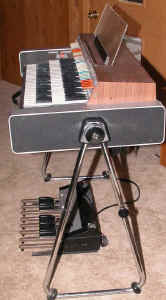 At one point, I owned a MELLOTRON, which was essentially a keyboard equipped with a lot of tape players. The MELLOTRON could make the sounds of a violin, flute, and other orchestra sounds. The tape lengths were 8 seconds long each. Groups like THE MOODY BLUES used these. I also owned a basic Moog synthesizer, but I was not very good at playing that. And we did the usual “rock group in the making” things. When we were in Wildwood, NJ for Senior Week 1973, we all had T-shirts made as band shirts. In retrospect, I should have had the word “keyboards” printed on the back, instead of “organ”. Playing the “organ” on the shirt inspired way too many bad jokes that week. That week is kind of a blur. We stayed in the Elna Ray Motel and bought supplies when we first arrived, with special attention given to liquid refreshments. The problem was in the way we built our shopping list and managed our money. A lot of money at the beginning of the week is not as much as you thought it was by the middle of the week. By then, with the milk gone, cereal was made edible with some less homogenized and more prooferized. Tasted like crap, but we drank all the liquid left over in the cereal bowl, just like mom said. We spent most of the time together as the group, wearing those ill-thought band shirts. We wound up spending about two hours inside the haunted house on Morey’s Pier. Not going through it, but finding places to hide and scare both patrons and the real workers. We ate a lot of pizza. We followed people home like lost puppies. One night, we met up with some girls and celebrated another girls birthday, I have no idea who. We fell asleep there, falling asleep on plastic upholstered furniture. Like sleeping on a dry swimming pool liner. Of course, it was also at this time that I was able to buy a magnificent organ, the FARFISA VIP 255. I also was able to get the greatest organ speaker ever, a LESLIE 147, with the spinning horn. Short of owning a HAMMOND B-3, this was the most magnificent sound I had ever heard. This double keyboard beauty rocked, pure and simple. I was so in love. THE JIM RASCAL BAND was together for almost 5 years. At one point, we numbered 7 members, with a three person horn section. I used to write the charts for them, and I loved doing that. While we were never famous, we did do a number of things that I will always treasure. We decided to write our own songs, some of which are now forgotten, but a couple still play in my head every day, like THE COURTYARD. I got to improvise an opening and middle solo on that one. Of course, being young and naïve, we decided to record these songs. We booked two days at the old QUEEN VILLAGE RECORDING STUDIOS run by the great WALT KAHN. We made the major mistake of wanting to record an entire LP in those two days, instead of concentrating on a couple of songs and drilling them down to get them right. The finished product was very good, at least by my standards, but those couple of stand outs could have been so much better. Up until about 15 years ago, I had a copy of these, but it is gone and sadly unavailable. If anyone reading this finds a copy, I will owe you my all. UPDATE: Thanks to Michael Mancini, brother of our drummer Ray Mancini, I can now share those recordings. I just heard these for the first time in 40 years. Click the link below. The second major rookie mistake: we thought the two day product was ready to be pitched to record companies. At the time, WEA (Warner/Elektra/Atlantic) had a regional office over near MAPLE SHADE, NEW JERSEY. We managed to hook up with a low level screener and met with him over there to show off our tape. He did listen to the whole thing and gave us honest advice, but as we met with him, we realized that we were not yet ready. We needed to work harder and keep learning. We also looked for more places to play that were not weddings. This became a mixed bag. We wanted to play, so we took a lot of gigs that were a bit awkward, like when we played our own Junior Prom. Yeah, that wasn’t weird. We also did some charity work for 56WFIL radio in Philly, such as playing for them at Broad and Walnut on OLD NEWSBOYS DAY. I still remember meeting the legendary JAY COOK at the WFIL studios so that he could give us the keys to a WFIL van to move our equipment down there. Our biggest gig was also our final one, though we didn’t know it at the time. We received a call from WMMR radio that the PHILADELPHIA FLYERS were looking for some groups to perform at JFK STADIUM while the place was awaiting the arrival of the FLYERS 1974 Stanley Cup Parade, which was going to come down to the stadium on Broad Street. We were thrilled, and put together a 20 minute set that included an amazing rousing version of I’M A MAN by Steve Winwood and by Chicago. We started it off by getting the crowd into a rhythmic FLYERS chant that set the beat for the bass opening of I’M A MAN. Imagine our thrill when tens of thousands of people chanted and clapped along! Yes, the stands in this huge stadium were filled, and while they were there for the FLYERS, for a few minutes they were ours, all ours. Even better, the band that followed us was thePhilly legends PIECES OF A DREAM. Our I’M A MAN chant even made the evening news, as KYW broadcast a film of a camera car circling the stadium to show off the crowd just as we started the song. Trust me, it still thrills me that for that one brief shining moment, we played where THE BEATLES played, and where LIVE AID, MICHAEL JACKSON, and so many other would play. And, I touched the STANLEY CUP. Shortly thereafter, we started to drift apart as the needs of college and work started to sober us up. We had our time and we had a great time during it. To my bandmates Louie, John, Ray, Mike, Carmen, Pompeo, Bob, and Jim, even though we haven’t seen each other in years, I still hear us every day in my mind. I almost went into radio, but never did. I would have been good at that, as well. 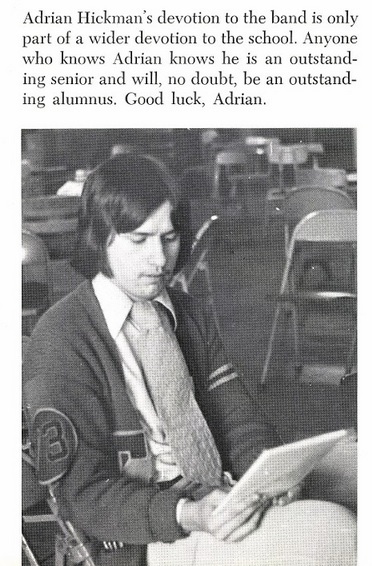 I was DON ADRIAN on the Villanova campus station WKVU and also was blessed to work on some comedy programming there with some very creative minds. Now, I try to find music I love as well as hook up with groups and projects to seem to share my same musical drive, a love of what they are playing and an amazing appreciation for what has come before. Nothing has been more inspiring than rekindling my love of Philly music thru the amazing passion and talent of David Uosikkinen and his In The Pocket project. I truly believe that my ability to relearn to live my life to the fullest is inspired by David’s ability to keep on rocking. Thru him, I’ve met so many other fans and musicians who make every day a joy. I really haven’t played in over 20 years and I am extremely rusty now. 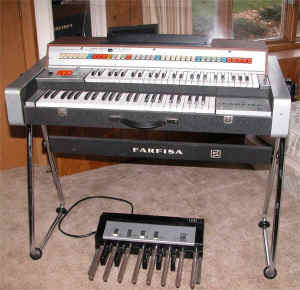 I’ve always wanted to get another keyboard, but every one I look at pales in comparison for my old FARFISA VIP 255. We were one when we made great music together. Someday, I’ll find another one and we will rock in front of the greatest crowd in the world, my music memories. iTuned In Or Out: It’s My Music And I’ll Sing If I Want To. OK, I admit it. While my musical tastes run all over the place, the place they run could probably use a little dusting. Don’t get me wrong. I think most of my music loves and choices are great and will stand the test of time. The rest, well, they are my musical choices, and tough if you don’t like them. However, that last paragraph contains the phrase “stand the test of time”, and that is really a concept that I can have a lot of trouble getting my musical chops around. After all, to paraphrase the group CHICAGO (or if you are really really ancient like me, you might know them as CHICAGO TRANSIT AUTHORITY): “Does anybody really know WHOSE time it is?”. Having come of age during the mid 60’s and 1970’s, those musical memories are going to be my main ones. More than any other time, a song from that period can be accompanied by a memory from that time in my life. There were so many new things to learn, and so many things to influence that learning, that it cannot be avoided that this period, at least for me, would remain vibrant throughout my life. Add in the fact that my musical tastes were formed at a time when music itself was undergoing a massive sea-change, with Rock And Roll giving way to Rock (and it’s various genres), bubblegum and folk, R and B gaining massive acceptance as Soul and Blues, and your parents music being christened as “outdated” even though much of it was less than 20 years old. Be it the post WWII years, the baby boom of the 50’s and 60’s, the fight for civil and personal rights, or whatever reason, the progression of music mirrored that massive human changes of the 60’s. You can point to dozens of musical milemarkers from that time, from the arrival of THE BEATLES, to the move of AMERICAN BANDSTAND to the West Coast, to Woodstock, to the breakup of THE BEATLES. There is a reason so much of this music remains vital today. However, this blog post is about MY music. Yes, there were momentous world events, but many of them were still seen by me through the eyes of a child. The Vietnam War raged while I was still in grade school. Kennedy was assassinated when I was in second grade (though I can honestly say that I remember where I heard the news. I was in my classroom at Our Lady Of Lourdes and the announcement came over the loudspeaker). The Civil Rights struggle was seen on black and white TV, but still, I was very young. Again, the Vietnam War would not really affect me until 1973, when I turned 18 and my birthday drew a high number in the lottery (269). So, this music becomes part of those memories, both personal and worldly, and definitely part of what I am today. So, when I look at my CD collection (yes, I still have a CD collection and yes, I love it), and look at what is on my radio dial, I realize that I can be perceived as living in the past. I dispute that. I simply remember the past, as all of us do, though triggers and touchstones. Now, getting back to the original jumping off point, I am always willing to give new music a listen. After all, so much of it is influenced by what has gone first, or at least the ones that I like. In addition, my musical tastes do change as my world does. When I was a kid, jazz was a total unknown. Then, little by little, jazz/rock music started to change that, starting with BLOOD SWEAT AND TEARS, and eventually growing into a true love of classic jazz. I also love discovering the current artists who keep this music alive, updating it without upsetting it, like JAMIE CULLUM, MARK RAPP, MICHAEL BUBLE, and SACHAL VASANDANI. As I admitted earlier, I own CD’s, I love CD’s, I buy CD’s, and I mourn the loss of the experience of physically browsing in a good CD shop and watching what others were interested in. Sorry, downloading and shopping on iTunes, for all the braggadocio about convenience, just isn’t the same. I do not want an algorithm telling me what I’ll like. However, I do own an MP3 player, and now that I have an iPhone, I own an iPod, which I long resisted. I like the iPhone/iPod very much except that I HATE HAVING TO RELY ON THE ITUNES INTERFACE. HATE, HATE, HATE. Enough hate. I have a Sony Vaio laptop, and it seems that iTunes has an issue with the Vaio computer checks that cause iTunes to drop my library out after a day or two, and I have to reload it, since the iPhone will only match up to the original library. That means time, and it also means I have to reload EVERYTHING onto my phone each time. Back to my musical tastes. My iPhone currently has 1700 songs on it. They run the gamut from classical to jazz to blues to country to what have you. Much of it is older, I admit. I even am guilty of having some very silly songs on there (MAHAMANA anyone?). However, as I look at the list, I realize that, unlike my computer which lets me store 100’s of GB of music, my iPod is much more narrowly reflective of who I am, where I was, and where I hope to be. That means that every song is added because it means something to me. Yes, that means that, for better or worse, MAHAMANA means something to me. I struggle to find new music that means the same to me. A lot of it starts out well on first listen, but doesn’t bear repeat listens. Others are simply not to my liking. Some make me wonder who the hell is actually listening to this crap. However, every so often, I find something new that works and keeps working. If you have suggestions, let me know. I am not a rock, but I won’t ever forget what has been there for me for so long. That is why I have BARRY MANILOW alongside of THE BEATLES and JOHN COLTRANE and MADNESS and NIRVANA and BEN FOLDS and GREEN DAY and hundreds of others. They all are simply what I like, and like enough to share with othesr. They are simply where I’ve been, and that past will be part of me forever. But, can I please have my CD stores back (and my video stores as well)?